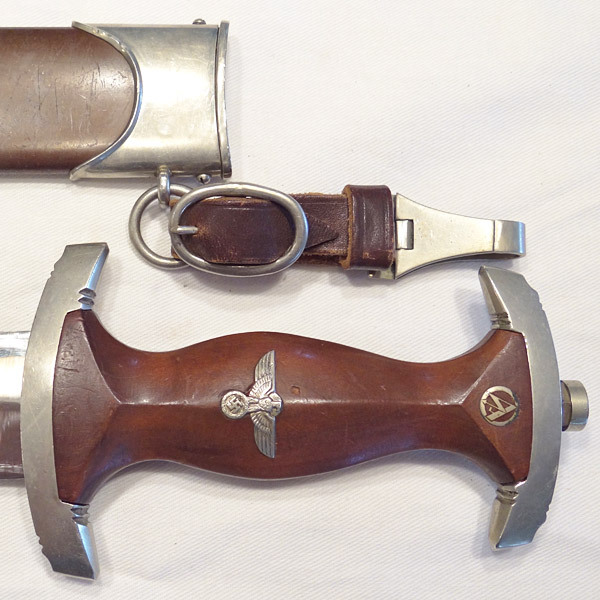 Very nice second pattern Luftwaffe Dagger with original sheath by Carl Eickhorn. 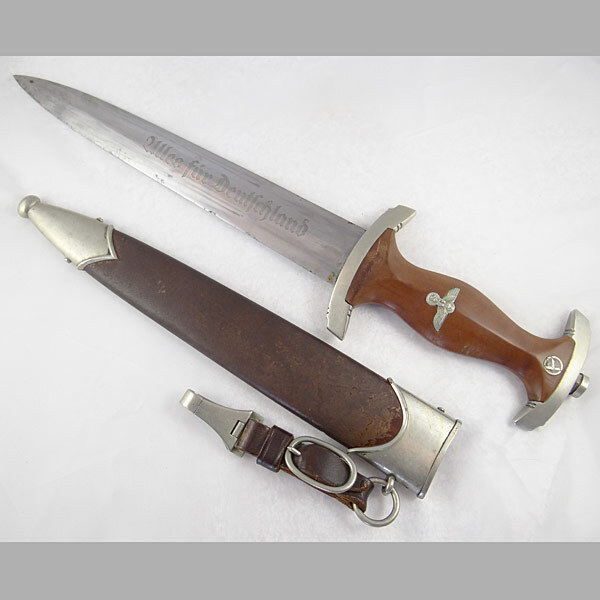 Eickhorn daggers are always more desirable due to the quality behind the name. 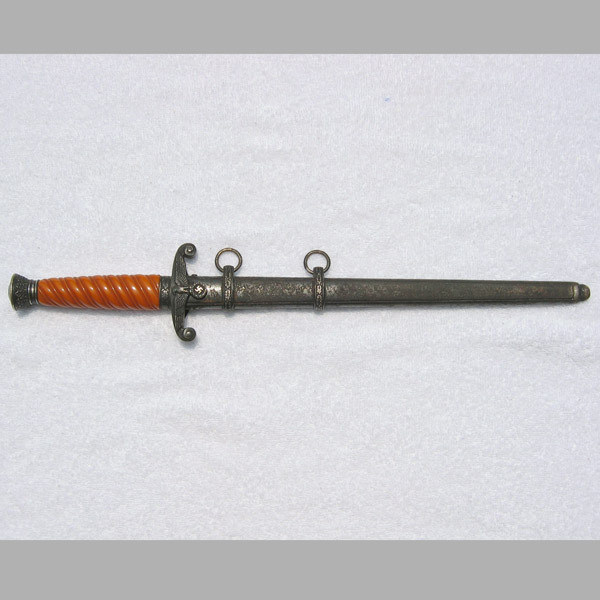 This piece is no exception with the traditional heart shaped pommel, and tangerine-orange color grip. 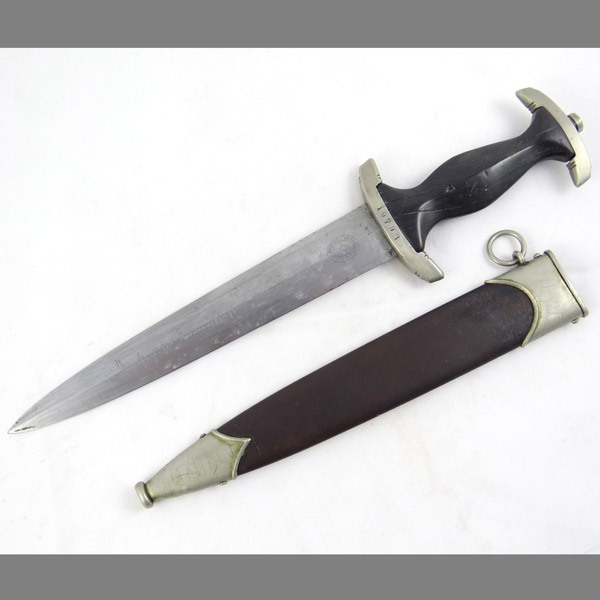 Aside from the hairline crazing marks you’ll find on most any period dagger grip, this dagger has retained much of its original detail, and a clean, near perfect blade to match! 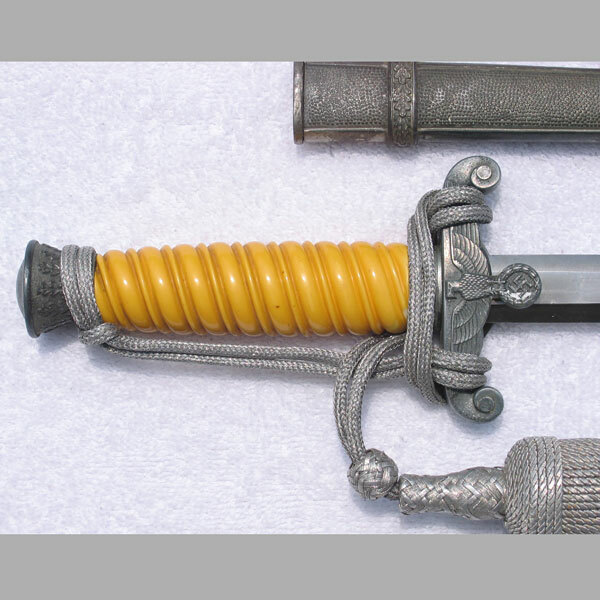 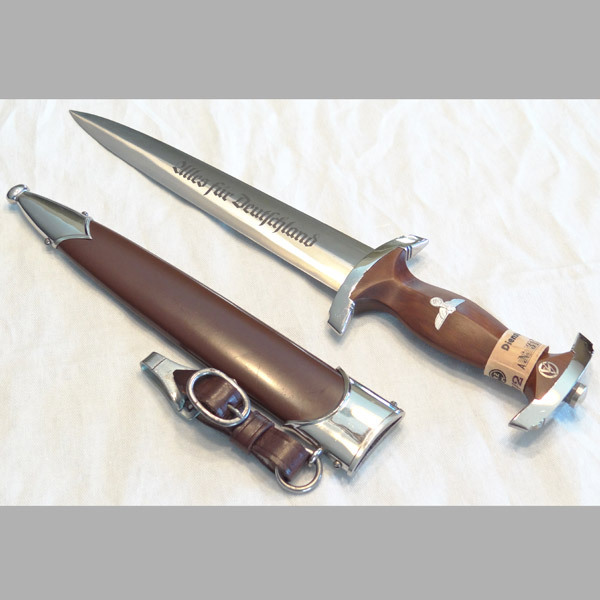 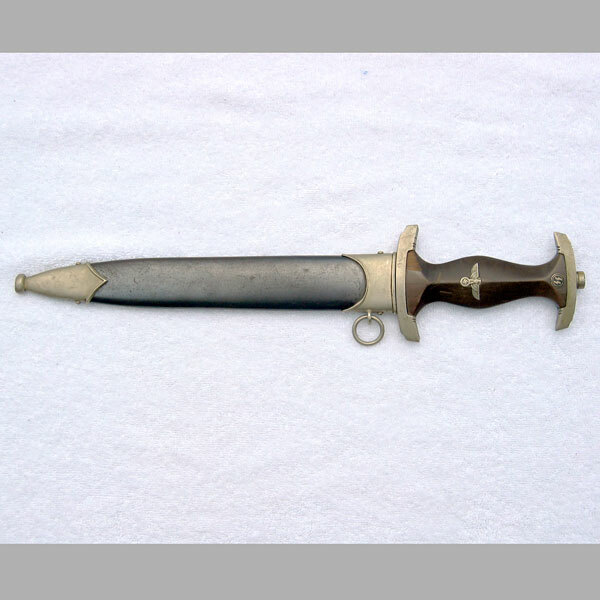 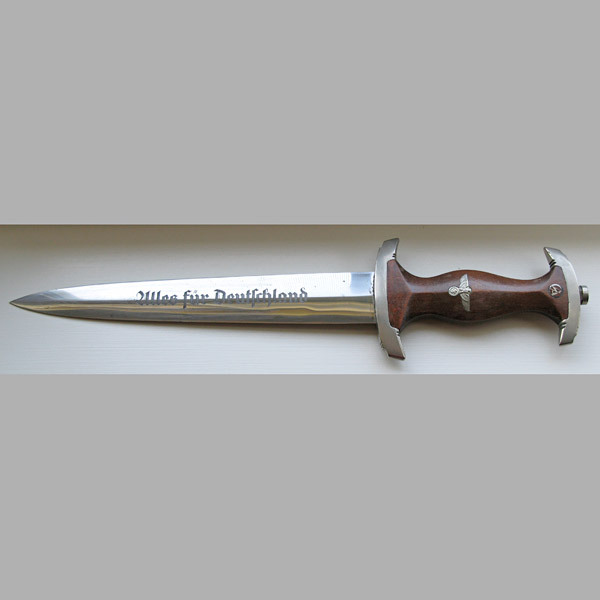 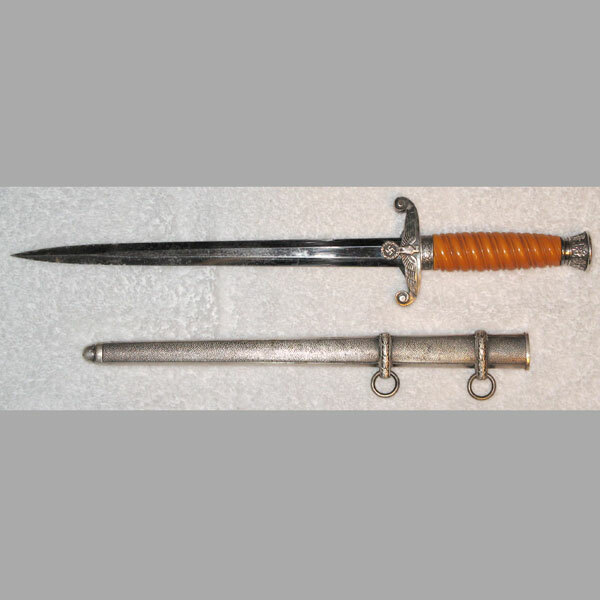 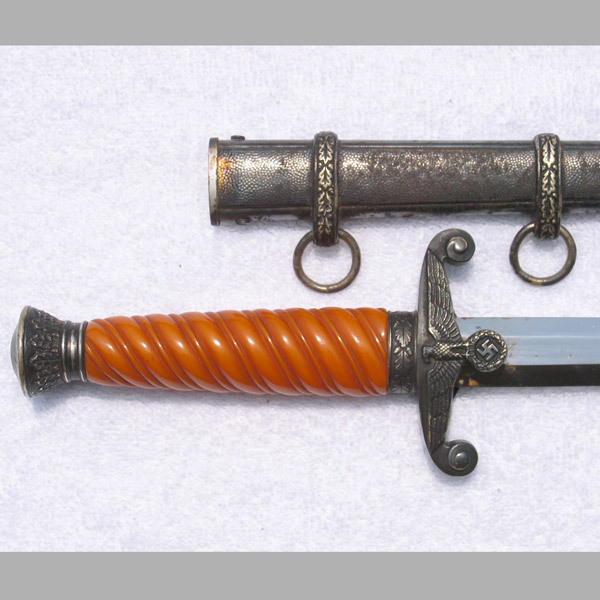 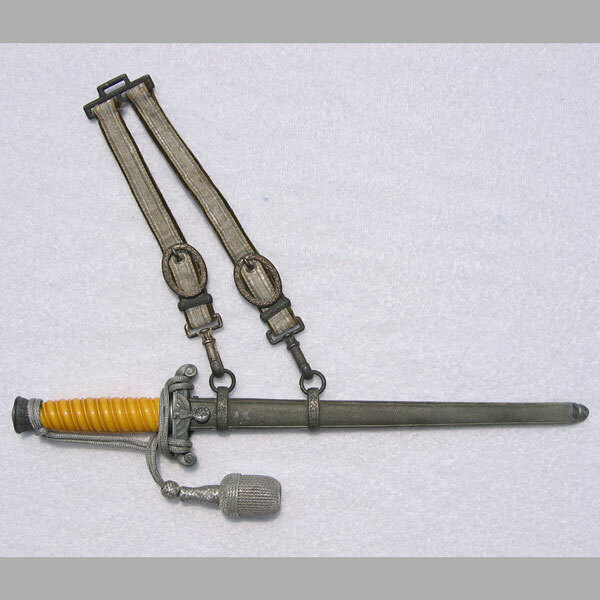 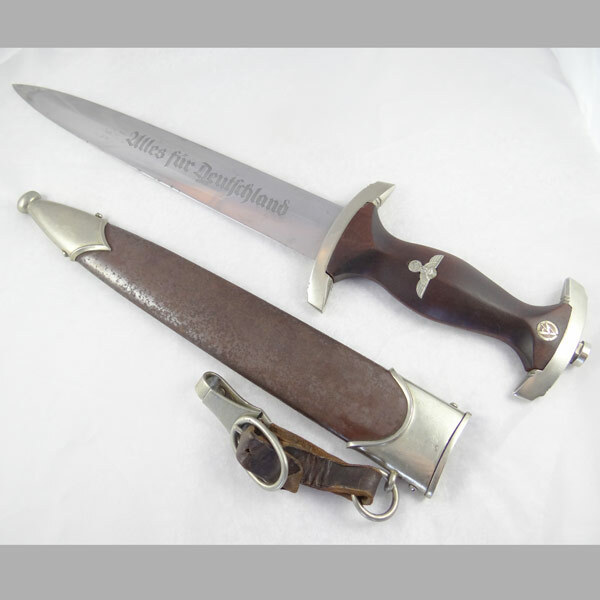 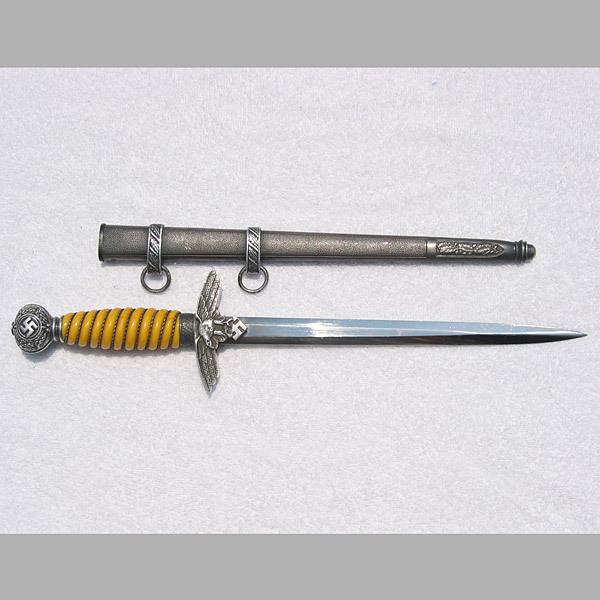 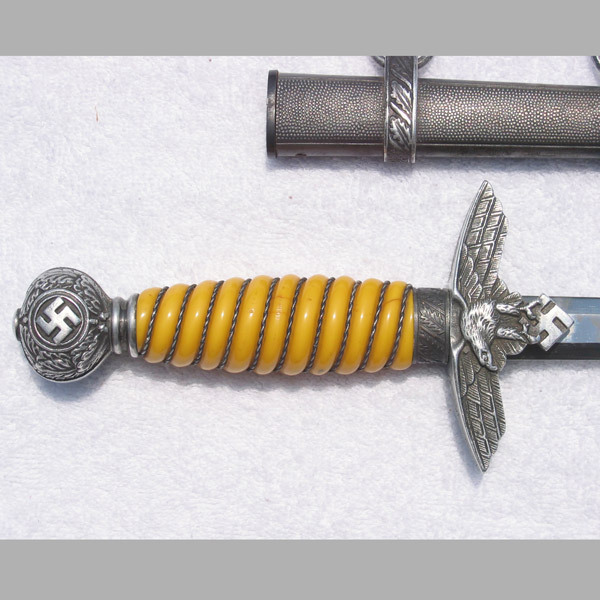 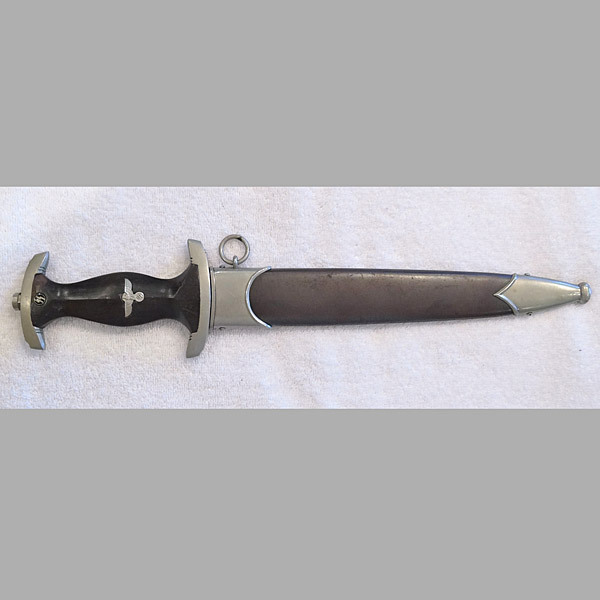 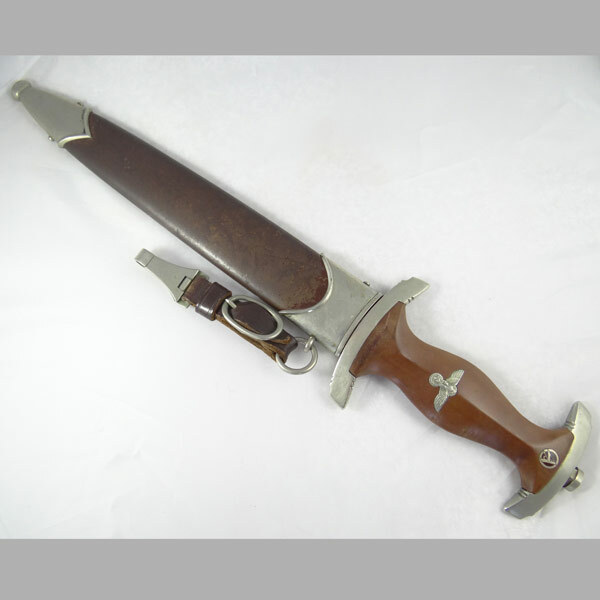 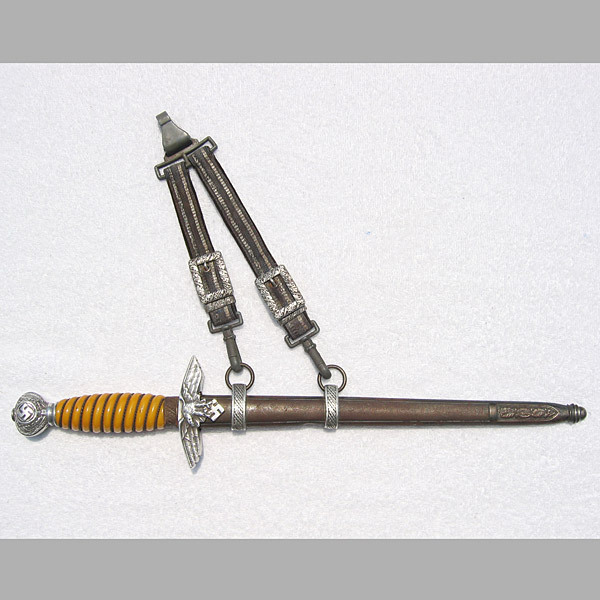 A later model World War 2 Hitler Youth dagger (a.k.a. 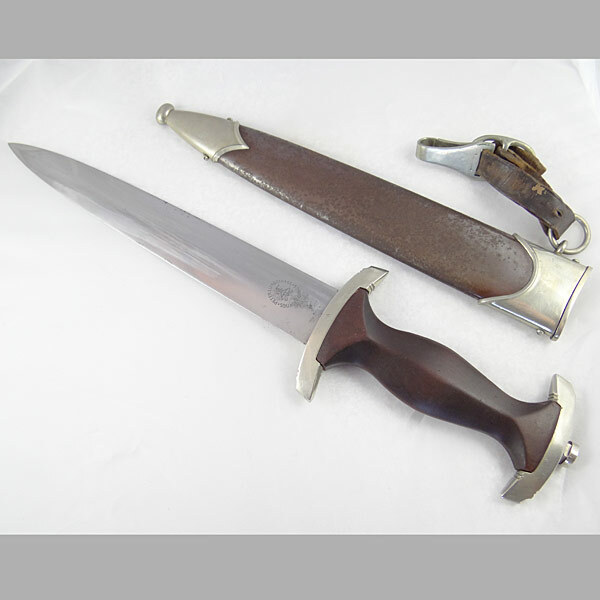 hike/camp knife) with original scabbard in average overall condition. 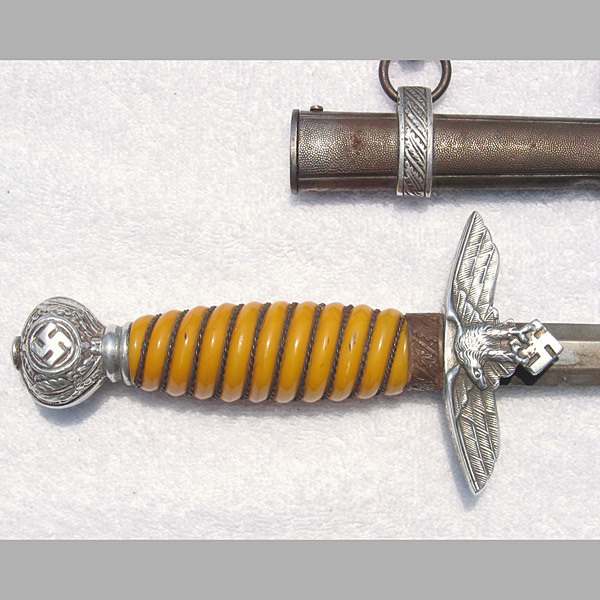 The red and white HJ emblem is in excellent condition, and slightly loose, which is fairly common with these WWII HJ Daggers. 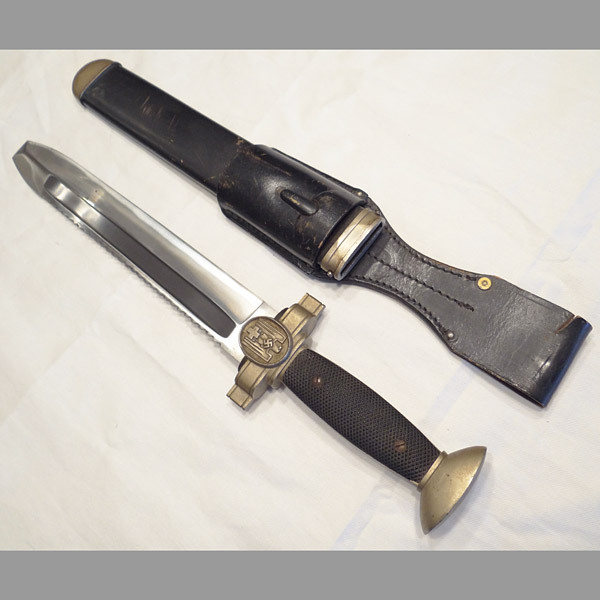 On the blade you can see what remains of an RZM marking, with 1941 beneath it barely legible after having been sharpened and used as much as it was. 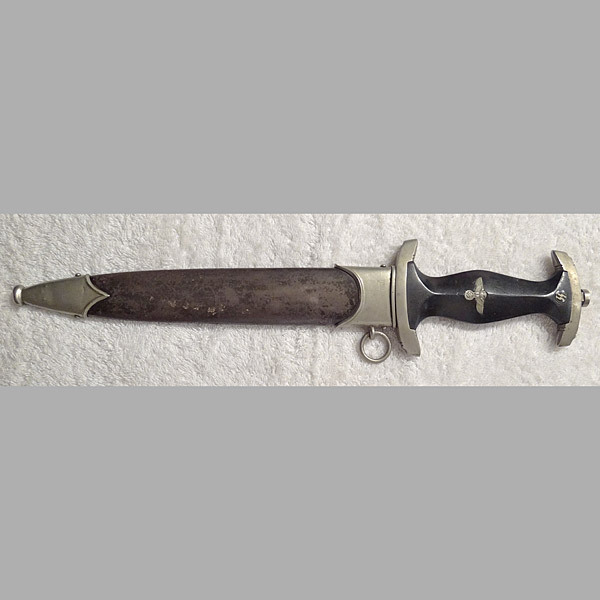 On the blades top edge, you can see several deep gouges, likely from wartime use. 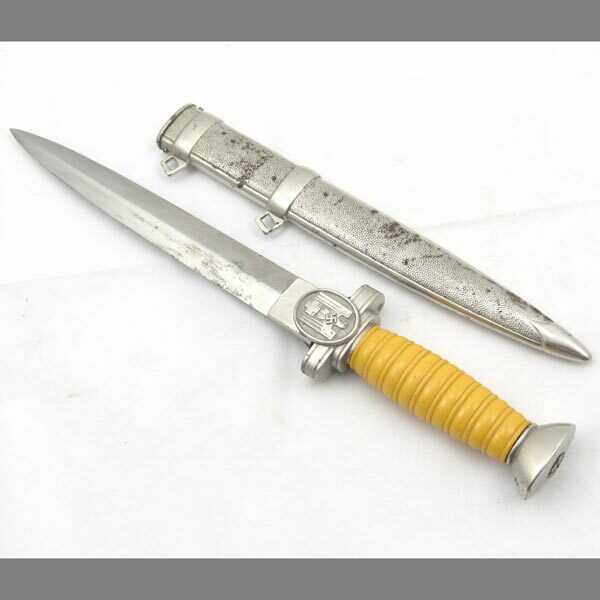 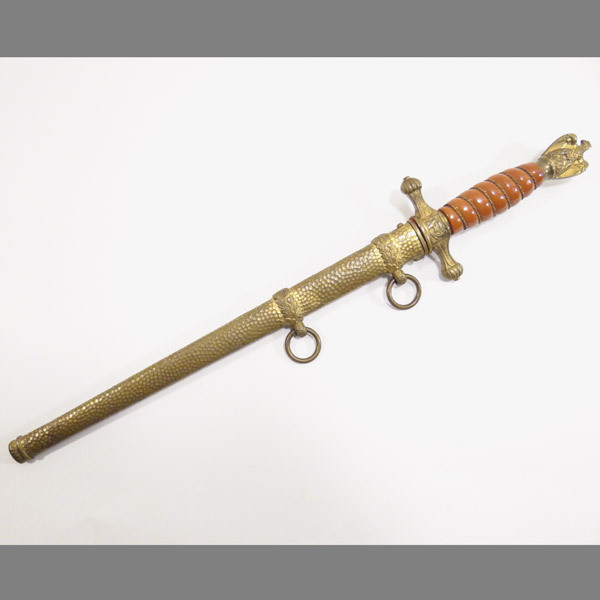 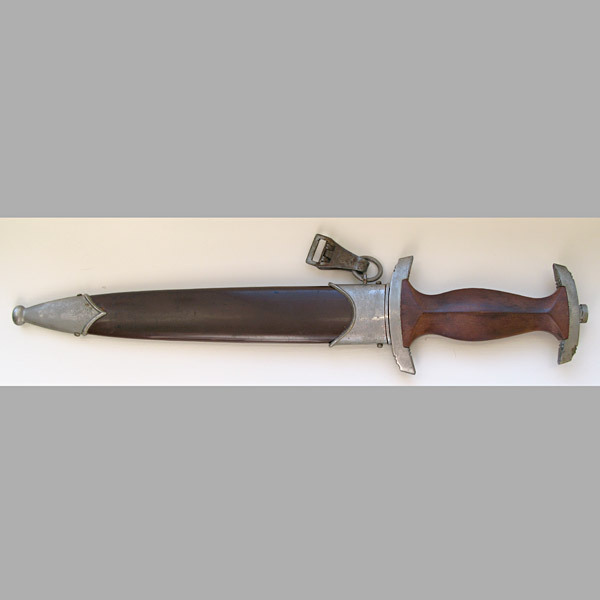 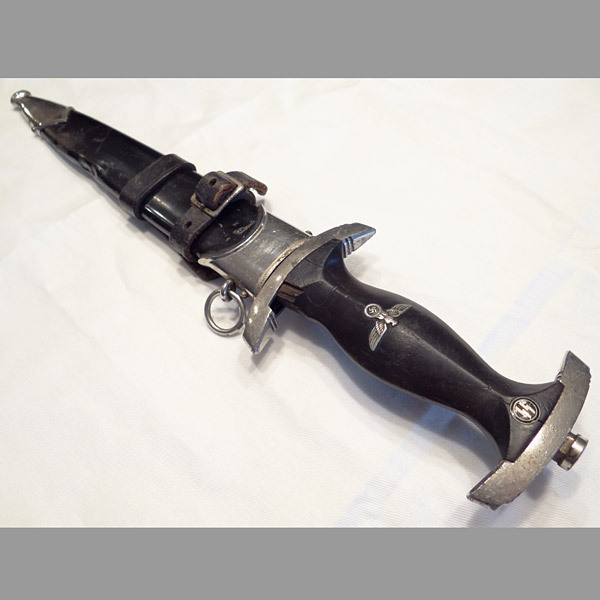 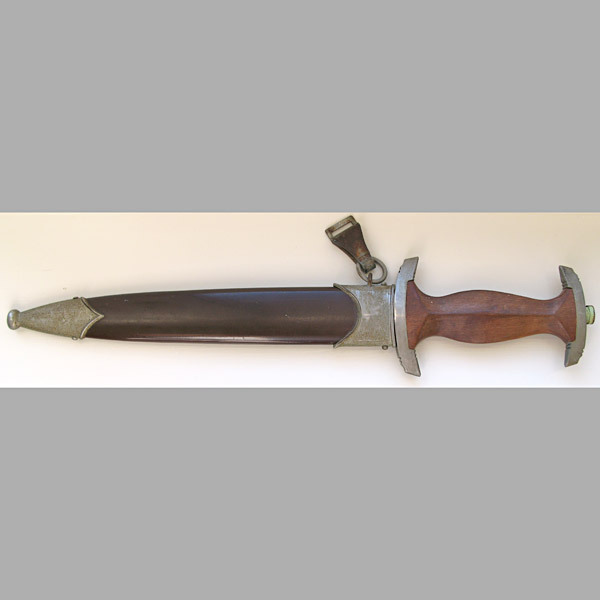 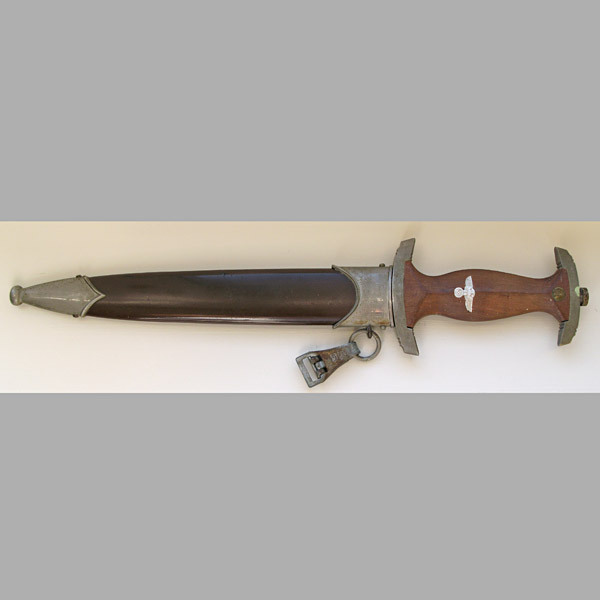 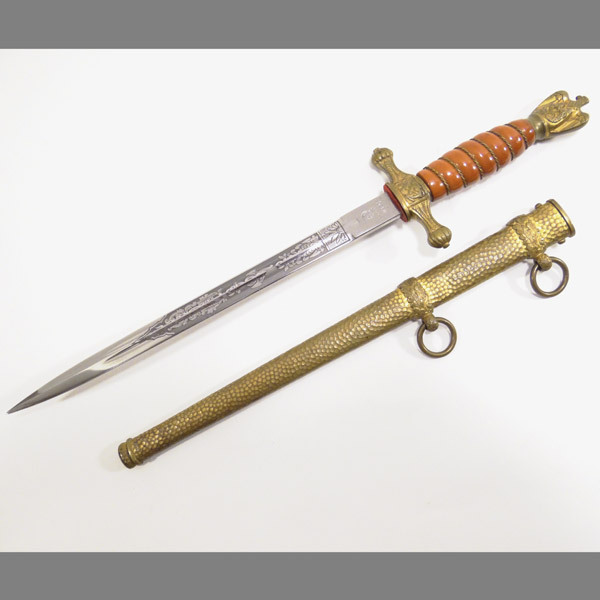 This German World War 2 Kriegsmarine Dagger just doesn’t get any better! 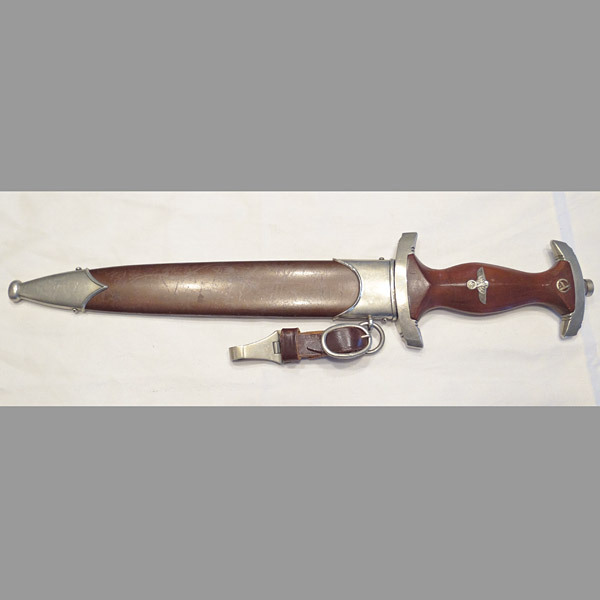 Purchased directly from the Grandson of the vet who brought it back to the states after World War 2, the condition is exceptional, with no notable chips or cracks to the handle. 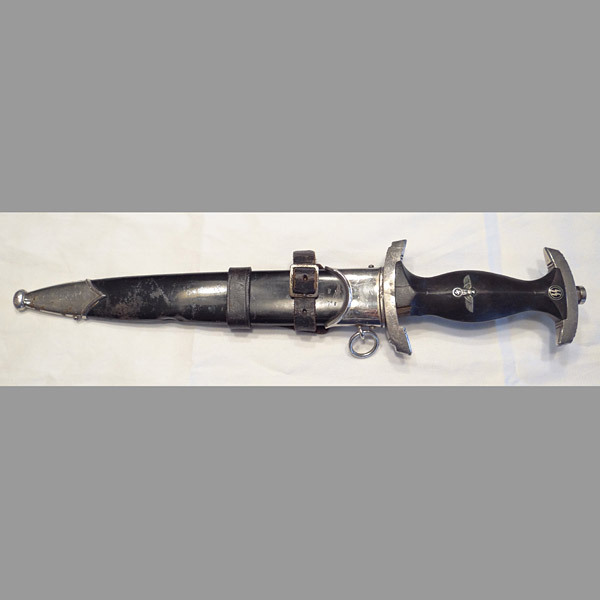 The pommel is loose, but I believe it could be fixed without compromising the integrity of the dagger. 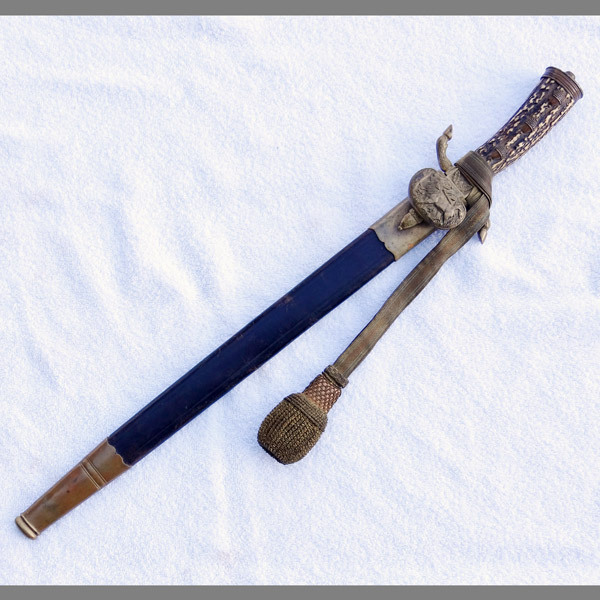 The scabbard is of the hammered (pebbled) style, with a minor dent. 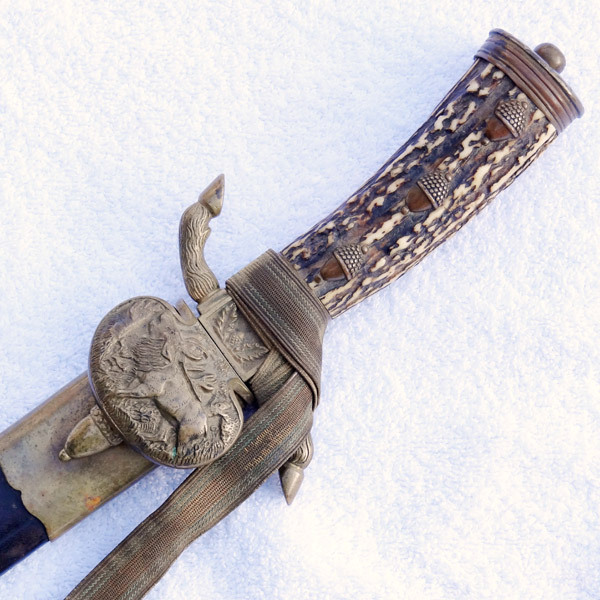 The blade has a very nice, dark etched design that is absolutely exquisite. 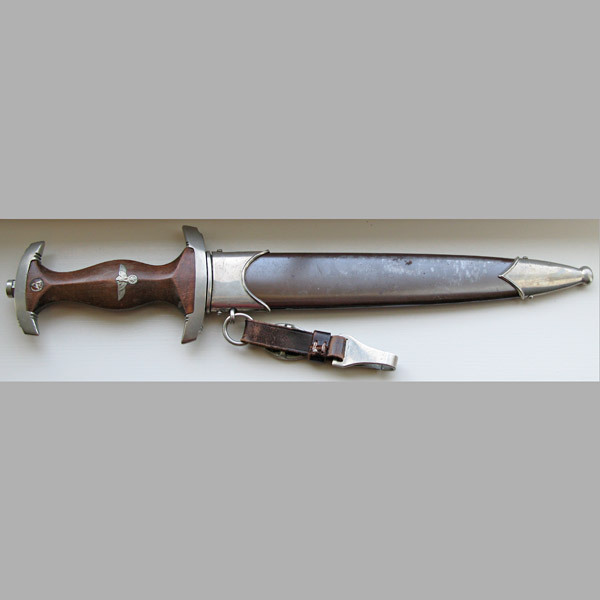 This is a very nice partially ground Ernst Röhm SS dagger by maker Gottlieb Hammesfahr. 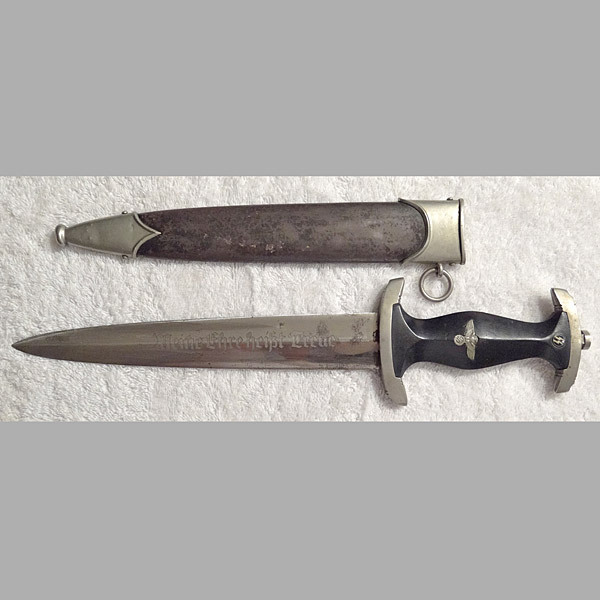 This dagger has been stored away since the war, only to be uncovered in the vet’s steamer trunk by his son who inherited his father’s military service items. 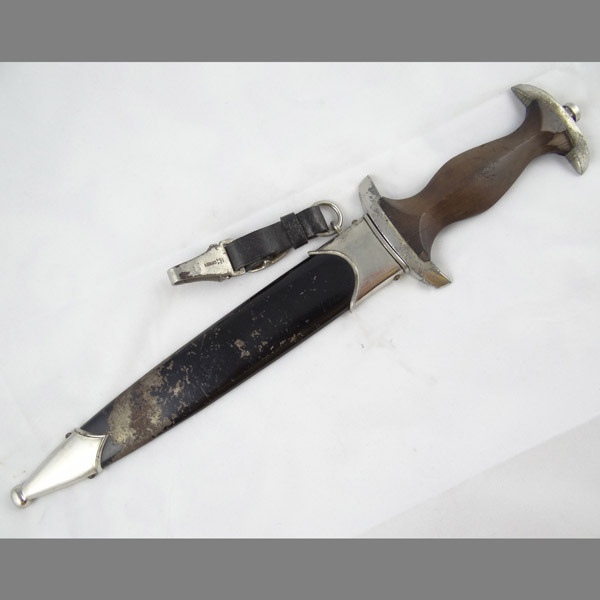 The overall condition of this late 1800s Forestry Cutlass, or sometimes referred to as simply a German hunting knife, is superb! 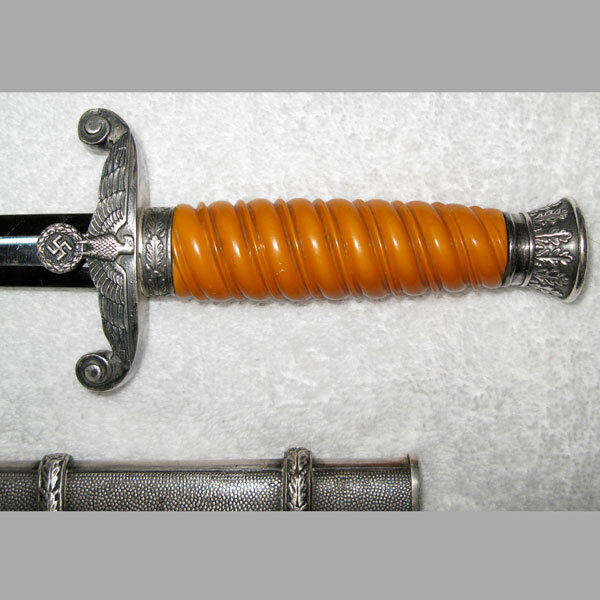 The stag grip is without flaw, sporting three acorn devices. 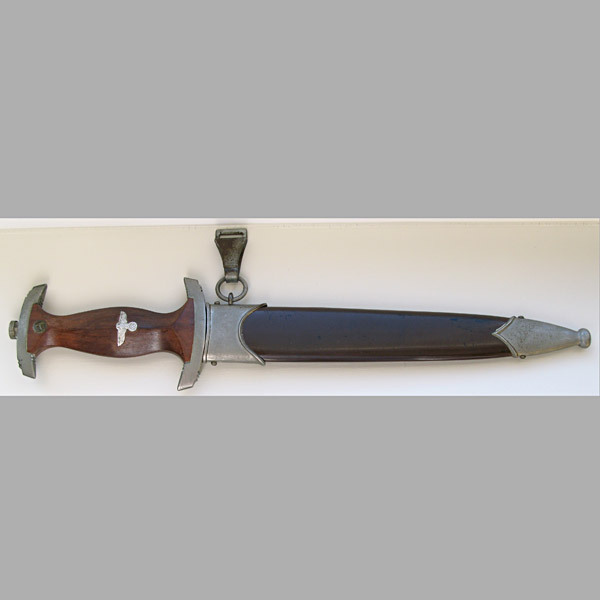 The hoof design cross guard leads into the clamshell, which shows a very ornately carved design of what I believe is an Elk. 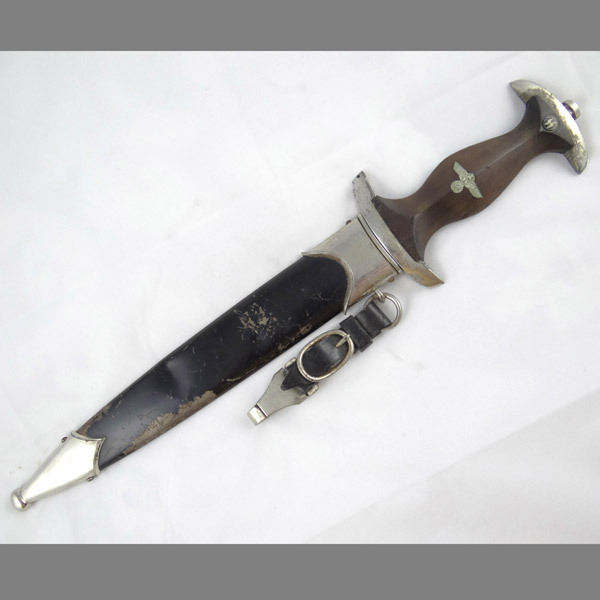 The blade of this SS Dagger is marked with the RZM 1198/39 manufacturer marking, and has a fair amount of scratches and spotting. 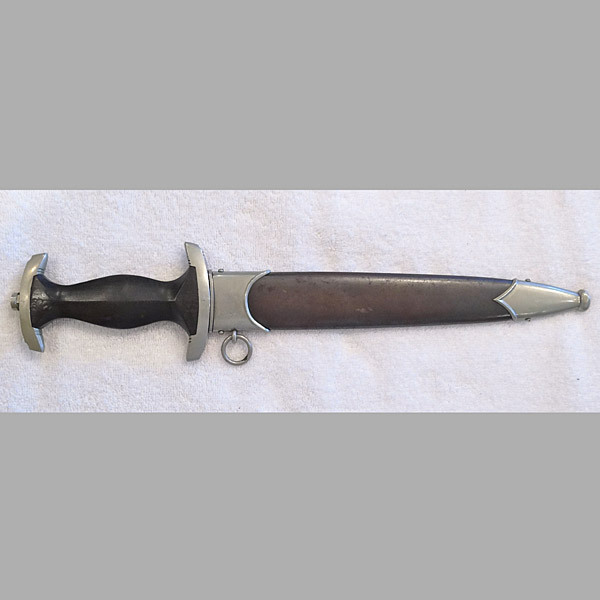 I wouldn’t say its been sharpened, but it does look as if someone may have tried steel wool on it at one time, until they realized it would leave marks. 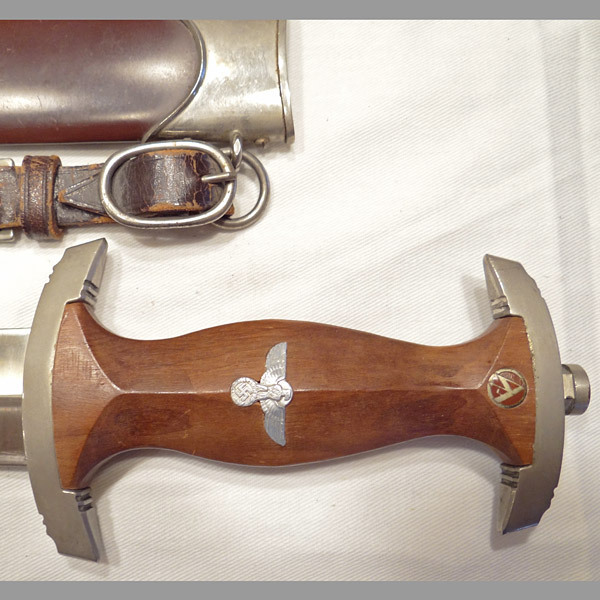 They’re not deep scratches by any stretch but visible in the right lighting. 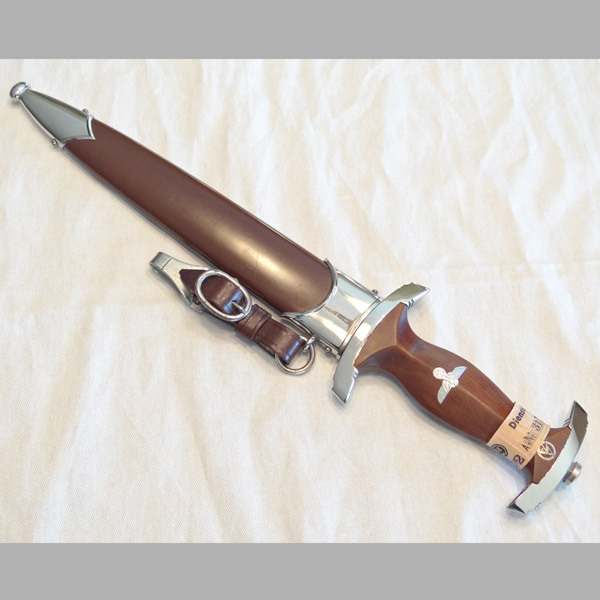 Still a great looking blade when comparing to many of the blades I see from day-to-day. 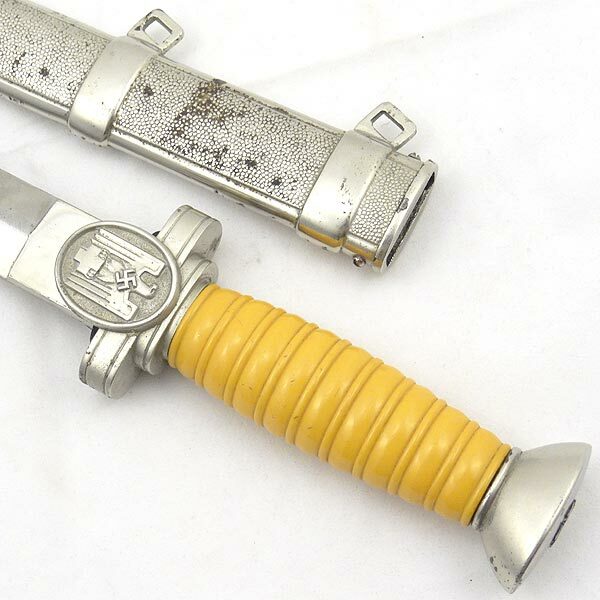 Absolutely mint, in the full sense of the word. 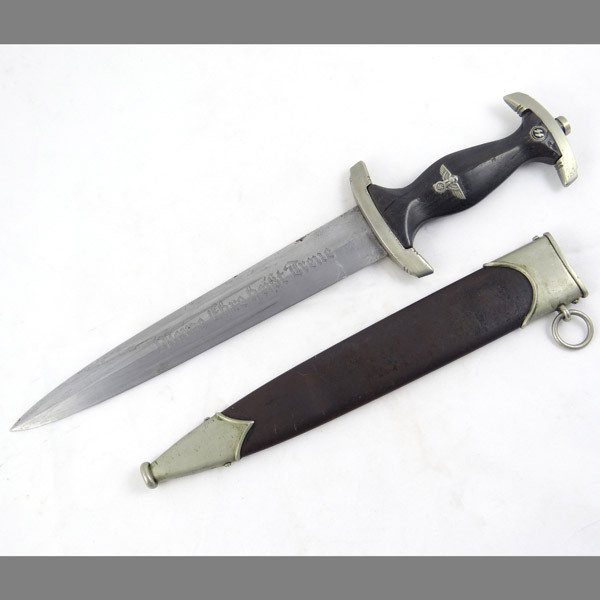 This Emil Voos (RZM M7/2) SA Dagger looks like it just came off the shelf, or out of a very well kept time capsule at very least. 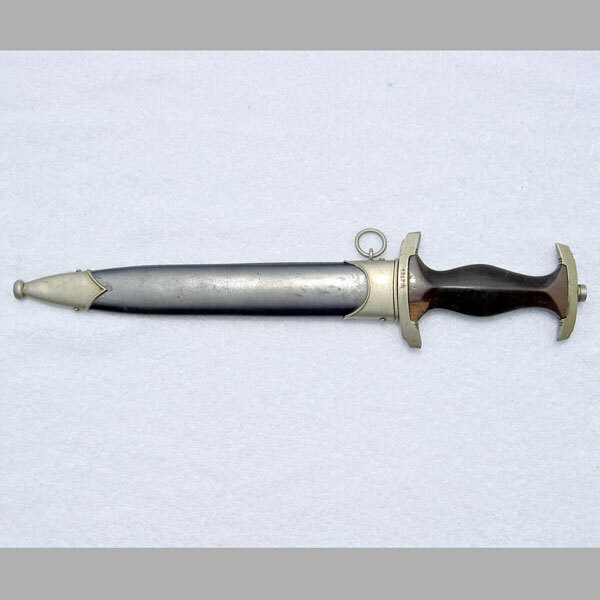 Still spoting the original tan RZM tag, which shows no signs whatsoever of decay and only very modest edge wear as seen in the photos (no rips or tears).